Uranium City is a settlement located on the northern shore of Lake Athabasca, about 760 km northwest of Prince Albert and only 50 kilometers from the Saskatchewan and NWT border. The town has a certified airport operated by the province and Pronto Airways still serves the community. The airport is one of the few employers left in the community. There is no all season road access connecting Uranium City with the rest of the country, but there is a provision for a winter road that connects with Fond du Lac. The current population is about 200, and includes a number of Métis and First Nations people. There are no First Nations reserves in the immediate vicinity. The site was discovered in 1949 by S. Kaiman while researching radioactive materials around Lake Athabasca. In 1952, the provincial government decided to establish a town to service the mines developed by Eldorado Mining and Refining, a federal Crown corporation. Uranium City was modeled after the mining community of Arvida in Quebec and grew significantly after a deliberate effort was made in 1960 to move staff from the Eldorado campsite into Uranium City. It was a thriving town up to 1982, with a population approaching 2,500 and infrastructure planned to support up to 5,000. The closure of the mines that year led to an economic collapse that resulted in the departure of most of the residents. 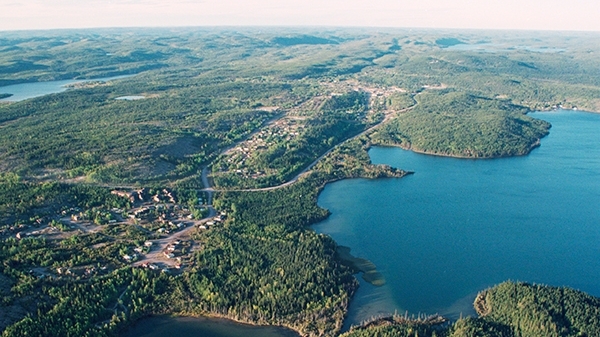 In June, 2016 the community of Uranium City, along with the First Nations of Black Lake, Fond du Lac and Hatchet Lake, and the three communities of Stony Rapids, Wollaston Lake, and Camsell Portage signed a historic collaboration agreement with Cameco and Orano (formerly AREVA Resources). The Yá thi Néné Collaboration Agreement is designed to enhance workforce and business development, environmental stewardship and community investment in the Athabasca Basin. The Yá thi Néné Joint Implementation Committee has released a 2017 Report to Community Members outlining progress made from the date of signing to the end of the year.